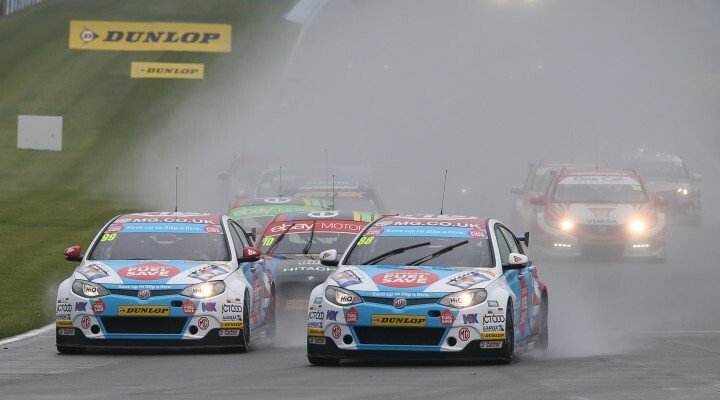 Sam Tordoff has taken his second ever BTCC victory with a win in race two at Donington Park. His MG KX Clubcard Fuel Save team-mate took a comfortable second place with Gordon Shedden rounding out the podium positions. It was however, a race punctuated by several safety-car periods as from the very first lap there were incidents up and down the field. It was a characteristically good start for both Rob Collard and Colin Turkington in their eBay Motors BMW machines. The pair passed reigning champion Andrew Jordan off the line, but a spin for Collard late on put him out of the race while Turkington was unable to maintain his pace to the flag, eventually finishing in sixth. It turned out to be the right place to finish for the Ulsterman, as number six was drawn in the reverse-grid draw leaving him on pole for the final showdown of the day. There was a heart-in-mouth moment for double BTCC champion Alain Menu on the opening tour. The Swiss driver found himself spinning across the track on the exit of Old Hairpin and was narrowly missed by a number of cars. His Chrome Edition Restart Racing Volkswagen ended the race beached in the gravel, leaving the race director with no choice but to bring out the safety car. The racing was soon underway again, but it wasn’t long before the safety car was required for a second time. A chain reaction of incidents involving a number of drivers left Chris Stockton and Rob Austin spinning across the grass on the inside of Redgate, while James Cole and Robb Holland came together and hit the wall on the outside of the same corner. Both cars sustained a fair amount of damage, and the teams will be working against the clock to get the repair work done in time for race three. Following the restart there was a fierce battle between Andrew Jordan and Gordon Shedden for the final spot on the podium. Jordan held on for a number of laps in his Pirtek Racing Honda Civic, with Shedden trying several times to get his Honda Yuasa Racing Tourer through at Coppice. Shedden eventually took the position following a mistake from Jordan that sent his car wide on the exit of Old Hairpin, giving the Honda Civic Tourer its first podium in wet conditions. Shedden’s team-mate Matt Neal also made an attempt to capitalise on Jordan’s mistake but couldn’t find a way through, finishing the race in a solid fifth place. Further down the order it was a strong showing from AmDTuning.com’s Dave Newsham in the Ford Focus. The Inverness-based driver was on an impressive charge in the final third of the race, first passing the RCIB Insurance Racing Vauxhall Insignia of Jack Goff before making a move on the Airwaves Racing Ford of Fabrizio Giovanardi. By the chequered flag Newsham has also made his way by the Speedworks Toyota of Tom Ingram to cross the line in ninth place. Click here for the full classification for race two.